I watched Carrie last night. It has been years since I'd seen it and it was never one of my favorites, but I was tired and have been feeling like I'm starting to come down with something. 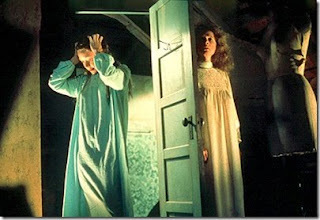 I always enjoy the Christian extremist mother, played to perfection by Piper Laurie. But I found myself feeling somewhat depressed as I watched it last night, realizing that what used to strike me as such an over-the-top example of Christian lunacy seemed somewhat less so. Could it be that this type of insanity is more accepted today than it was when Carrie debuted in 1976? What a horrible thought! And yet, I think there is something to it. As good as the mother was, the sort of religious gibberish she spouted was not that different from what I've heard from Sarah Palin, Mike Huckabee, and a variety of prominent fundamentalist Christians with armies of devoted followers. It seems like America's tolerance for religious insanity has increased. I realize that one can point to trends that suggest declines in religious belief and practice. But these trends do not take into account that many expressions of religious belief by today's politicians would have cost them their positions a few decades ago. Christian extremist organizations such as "the Family" have done their job extremely well. I still enjoy Carrie and may have to pick up the Blu-ray version one of these days. But it doesn't disturb me the way it once did. After all, I have seen Jesus Camp .